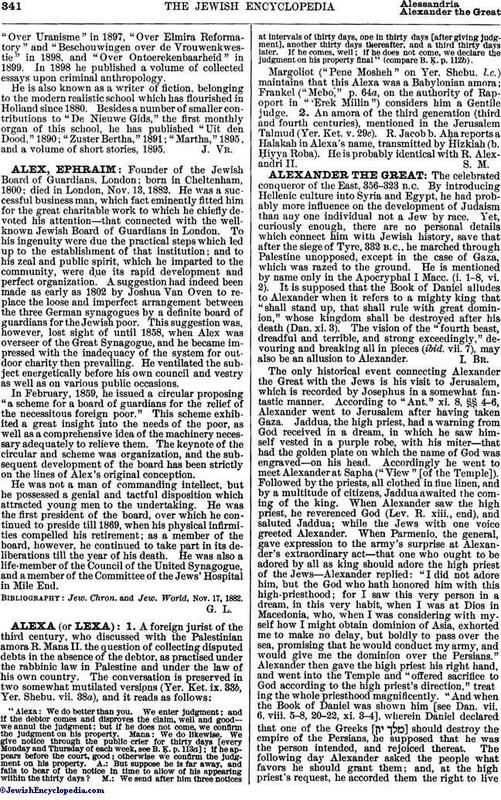 Founder of the Jewish Board of Guardians, London; born in Cheltenham, 1800; died in London, Nov. 13, 1882. He was a successful business man, which fact eminently fitted him for the great charitable work to which he chiefly devoted his attention—that connected with the wellknown Jewish Board of Guardians in London. To his ingenuity were due the practical steps which led up to the establishment of that institution; and to his zeal and public spirit, which he imparted to the community, were due its rapid development and perfect organization. A suggestion had indeed been made as early as 1802 by Joshua Van Oven to replace the loose and imperfect arrangement between the three German synagogues by a definite board of guardians for the Jewish poor. This suggestion was, however, lost sight of until 1858, when Alex was overseer of the Great Synagogue, and he became impressed with the inadequacy of the system for outdoor charity then prevailing. He ventilated the subject energetically before his own council and vestry as well as on various public occasions. In February, 1859, he issued a circular proposing "a scheme for a board of guardians for the relief of the necessitous foreign poor." This scheme exhibited a great insight into the needs of the poor, as well as a comprehensive idea of the machinery necessary adequately to relieve them. The keynote of the circular and scheme was organization, and the subsequent development of the board has been strictly on the lines of Alex's original conception. He was not a man of commanding intellect, but he possessed a genial and tactful disposition which attracted young men to the undertaking. He was the first president of the board, over which he continued to preside till 1869, when his physical infirmities compelled his retirement; as a member of the board, however, he continued to take part in its deliberations till the year of his death. He was also a life-member of the Council of the United Synagogue, and a member of the Committee of the Jews' Hospital in Mile End. Jew. Chron. and Jew. World, Nov. 17, 1882.